This looks great! I have been craving stuffing too. those bears are adorable! great job! Looks good to me too! I did notice that the pear and the egg look to be the same size. Either your hens are laying some really big eggs or the pear is on the small side! lol The little bear holders are so cute! No wonder you can get him to eat his brussel sprouts! Will you post how you make your brussel sprouts? I'm usually not a fan, but yours seriously look yummy! Your bears are too adorable and are perfect for you! Cute lunch! 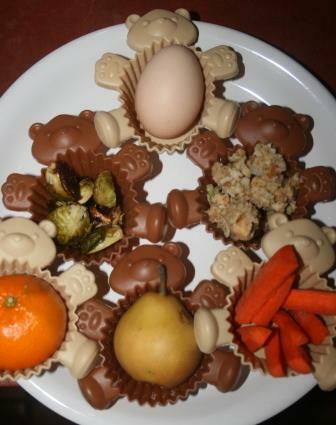 I really love those bear muffin cups!